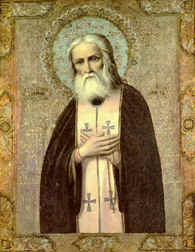 St. Seraphim of Sarov is one of the most beloved saints in the 20th century, not just in Russia, but throughout the Orthodox world. In a period of spiritual decline and darkness, his was a light that has lit up the 18th, 19th and 20th centuries, and continues today in the 21st century even brighter than ever. Almost an exact contemporary of St. Herman of Alaska (see our Life of St. Herman), their humble and simple ascetic personalities are quite similar. 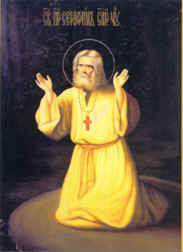 St. Seraphim is loved for his Paschal joy and love with which he embraced all creatures, greeting people year-round with the exclamation, "Christ is Risen! "; for his humble and patient acceptance of all things at the Lord’s hands, including lengthy illnesses and being beaten almost to death; for his emphasis on the acquisition of the Holy Spirit as the goal of the Christian life, using prayer, almsgiving, fasting and charitable works done for Christ’s sake as a means of achieving that goal; and for his intimacy with the Holy Birthgiver-of-God and her appearing to St. Seraphim in visions, and healing him. 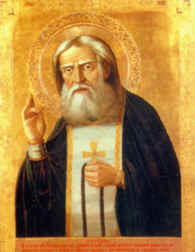 Holy Father Seraphim is known for feeding bears and other wild animals when he lived in a cabin in the woods; for the 1,000 days and nights he spent praying on a rock near his forest cabin (icon to the left); for the experience of the warmth, radiance, peace and joy of the Uncreated Light, which he allowed to envelop his disciple, Motovilov; and for countless miracles. 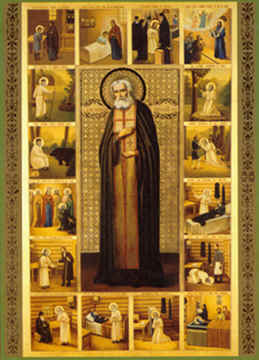 The future saint, Prochor Moshnin, was born in 1759 in the city of Kursk of a pious merchant family. When he was 10, the Mother of God healed him from a severe illness through her Kursk-Korennaya Icon. As a youth, Prochor spent as much time as possible in church, and used the gift of reading to devour the Bible, the lives of the saints, the writings of the Church Fathers, and liturgical books, which he continued to do for his entire life. His heart’s desire was to dedicate his life to serving God as a monk and thus, at age 19, he obeyed an Elder’s counsel to go to the Sarov Monastery, where he spent the rest of his life. After 8 years, during which time he nearly died — until he was healed by the Mother of God — he was tonsured a monk, and then a deacon. While serving at the altar, he frequently saw angels, and once, on Holy Thursday, he was transported in ecstasy for several hours by a vison of Christ Himself. At age 34, Fr. 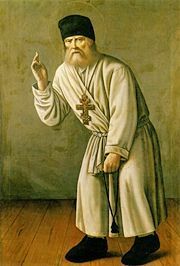 Seraphim was ordained priest, and then his elder entrusted to him the spiritual care of the sisters at the nearby Diveyevo Women’s Monastery (west of Nizhni-Novgorod), which became "his" Diveyevo. He then also received permission to live by himself in the forest, praying, reading the Church Fathers, and every week, reading the entire New Testament. At age 45 he was beaten by robbers and left for dead. During his long recovery, the Mother of God again appeared to him with the Apostles Peter and John the Theologian, and said of him: "He is one of ours." After this he recovered, but was always bent over and walked with a cane. More years of seclusion in the forest and in his monastery passed, and then the Mother of God directed him to receive people who came to him for spiritual comfort and guidance. For 7 years, thousands of pilgrims came seeking assistance from the Elder, as people have continued to do throughout the 20th century, especially after his glorification in 1903. His wonder-working relics were miraculously discovered and returned to Diveyevo with triumphant joy in July 1991. The second icon from the bottom was painted/written by Fr. Theodore Jurewicz, of Erie, Pennsylvania, and is located in St. Innocent of Irkutsk Orthodox Church in Redford, Michigan. The other icons are from Russia.